Don’t Stink on Skin Care! In my last couple of years of being around hospitals for uni, I have seen my share of diabetes related foot ulcers. Some have healed nicely, others became chronic and some required amputations. Even after all this time, there is still that fear at the bottom of my heart that one day, I could be facing the same issues in the coming years. So for the first time last year, I sought out a podiatrist to make sure I’m doing what I can to prevent this nightmare from happening. Prevention is always better than cure right? So what are other steps we can take to look after our feet, aside from our half yearly to yearly visit to the podiatrist? Well I think the biggest and most simple thing we tend to neglect is our skin! Some biology 101: our skin is the largest organ that we have. It protects our sensitive internal workings the harsh environment that is around us. Once that barrier is broken by a tear or a cut, it leaves us very vulnerable to infections from bacteria and other nasties floating around. For some people with diabetes, we may notice that our bodies take a little longer to heal and recover from things like colds. And wounds are no exception, which leaves us with a bigger window of opportunity for infections to take over. Some of the simple things we can do to keep our skin healthy is to drink plenty of water and moisturise. We’ve been told that drinking your 8 glasses of water a day has many health benefits such as keeping us regular. Water also plays an important role in keeping our skin well hydrated. This is especially important for as we age, our matured skin tends to lose its elasticity (so it’s not as resistant to physical impact in a sense). Another way of keeping our skin nice and supple is by using a good moisturiser. No doubt it’s getting increasingly intimidating when we go to a chemist to get something that works. We are bombarded by so many products, each claiming to be better than the next. Remember that everyone has different skin types and while one moisturiser may work for you, it may not be as effective for someone else. Other simple ideas to think about is just routine checking of your skin (particularly your feet) and being vigilant with any existing cuts or wounds. Make sure any cuts or wounds heals properly and always see a doctor if there are any signs of infections. Why have I suddenly gone on this tangent of skin care? 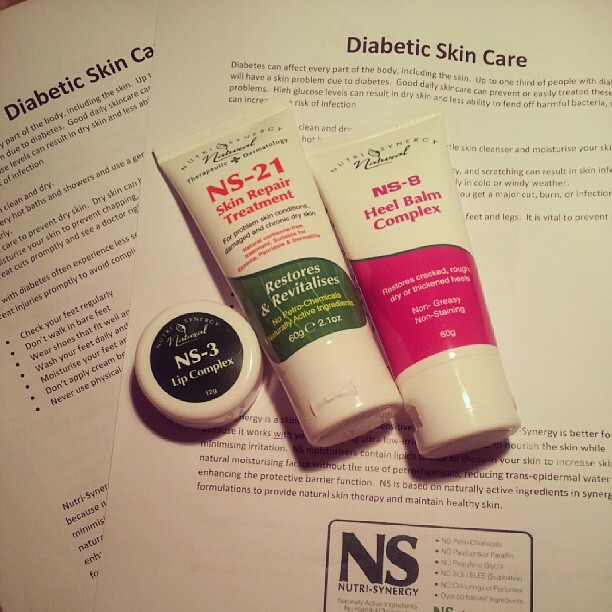 I’m currently trialling the Nutri Synergy (NS) skin care range specially for people with diabetes from Plunkett Pharmaceuticals. I have been using them for a few days now but watch this space for a full review of some of their products in the coming week or so! Thanks Plunkett Pharmaceuticals for letting me try and review these products!